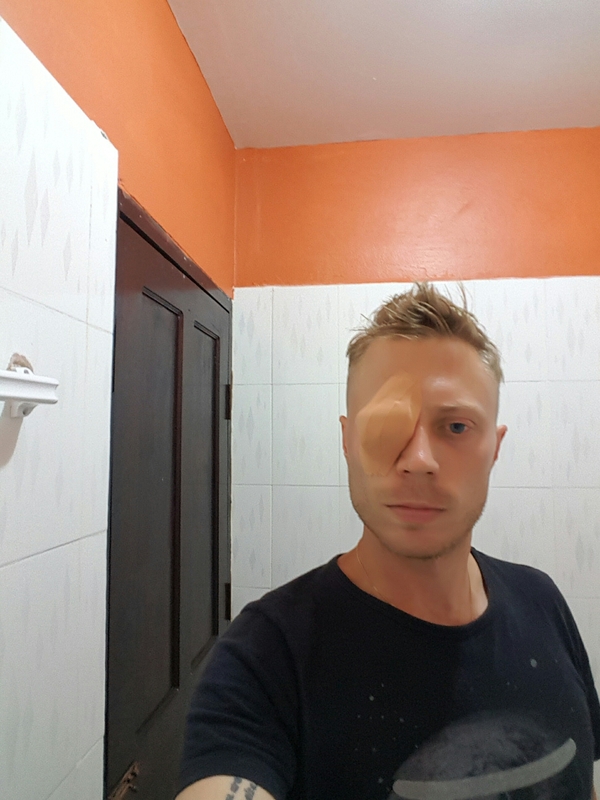 On the way to Luang Prabang I got some kind of infection in my right eye. I went to a small clinic and got some antibiotic eye drops and was sent on my way with the promise it would heal within a couple of days. At first it seemed to work, the pain lessened and it got a bit better but when I woke up this morning it seemed to have gotten worse. I went to the hospital where I was told they didn’t have an eye doctor but they sent me to a separate clinic in town. The doctor there immediately declared my eye drops to be not good enough and threw them away. He then put some more powerful antibiotic cream on my eye and covered it with a bandage. Though he said I could travel I felt in no state to do so, especially considering that i don’t know what kind of hospitals are available in other parts of the country. So, I’ve extended my stay in Luang Prabang to give myself time to rest. This means I will miss my booking for something called the Gibbon experience where you live in a tree house. I was really looking forward to that but my health is more important. Hopefully my eye will be better tomorrow, if not I will consider ending the trip early in order to get better treatment at home. Eye patch like a not-so-cool pirate.